March 24th 2015, Complex, Glendale CA: Fort Collins, Colorado extreme metal band Allegaeon released a highly impressive third studio full-length album called ‘Elements Of The Infinite’ in 2014 via Metal Blade Records, and were heralded not only for one of the strongest releases of that year, but also as worthy newcomers in the genre. They’ve visited Los Angeles several times in the recent past, putting forth stellar shows on every occasion, and they returned as part of their ‘Get Rekt’ North American headline run along with support act Product Of Hate, for a gig at Complex in Glendale put together by Church Of The 8th Day which also featured local openers Thrown Into Exile and Servile Conceptions. 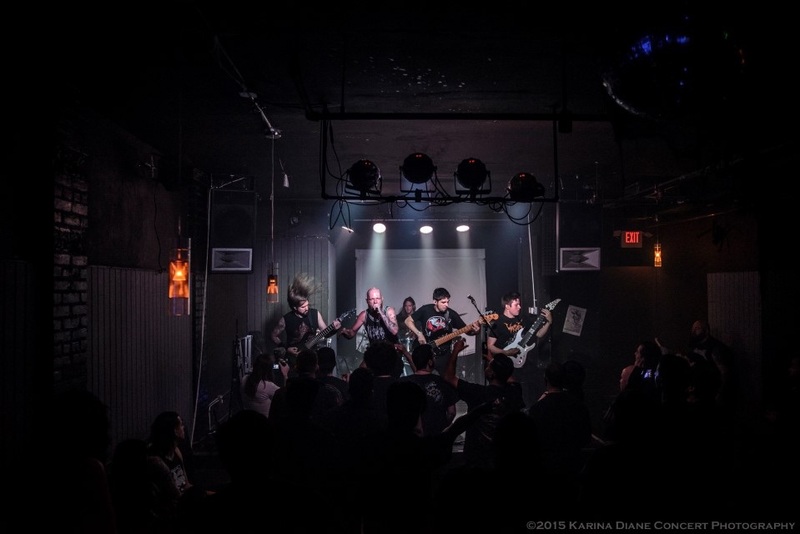 Allegaeon’s performance was expected to be great, but all four bands combined for a delightfully heavy and immensely groovy evening at LA’s finest underground metal venue. Doors opened at 8 and the show began at 8:45 with Servile Conceptions taking the stage for 25 minutes of brutally solid death/black metal. They ripped through quite a few songs within such a short duration and possessed plenty of speed in most of their tunes, but I found the slower, doomier segments more enjoyable as it highlighted their guitar work better. A fine choice as opening act for this lineup. 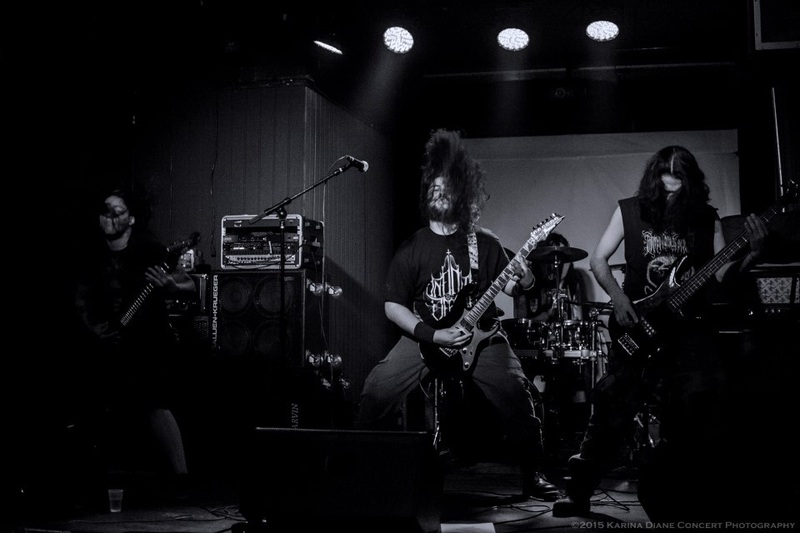 LA metal powerhouse Thrown Into Exile were up next, intensifying the atmosphere and laying down the grooves as well as the melodies to equal effect. Led and nurtured by guitarist Mario Rubio through thick and thin over the past few years, Thrown Into Exile now boast of an excellent frontman in Henry Derek, who showcased his talent in plenty with a wide vocal range that blends brilliantly with the varying guitar patterns. They sounded darker and heavier here than the gig they played at the Whisky opening for Death Angel in December 2014, which certainly has a lot to do with the vibe of the Complex lending an altogether different texture to any band’s output, specially in comparison to the Whisky-A-Go-Go and the Sunset Strip. 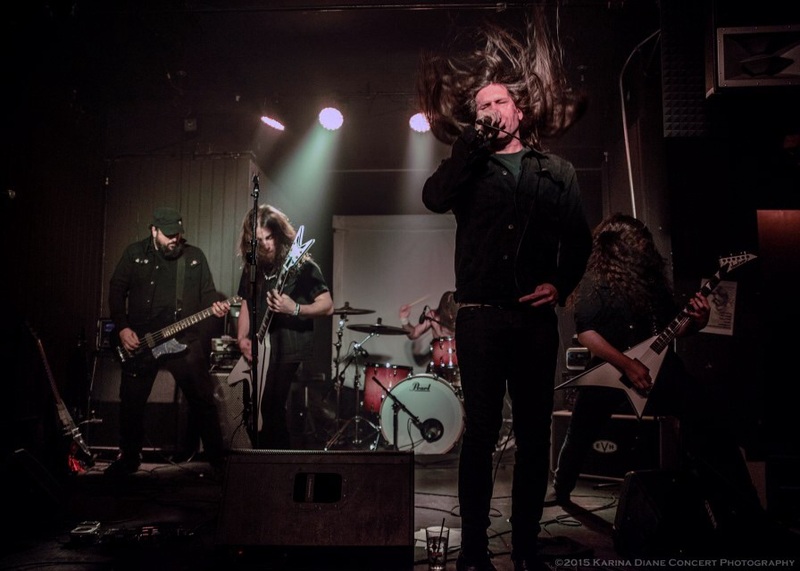 Provided they can keep this lineup of very seasoned musicians together, Thrown Into Exile are ready to take the baton from the American modern heavy metal bands of the past decade or two. Main support act Product Of Hate went about their mission of destroying this stage with much conviction. This is the first band I’ve heard of from Kenosha, Wisconsin since the emergence and subsequent disappearance of Lazarus A.D., and Product Of Hate did not do their town’s reputation any harm at all, playing a fiercely energetic set filled to the brim with quintessential modern metal and decorated by grooves galore. And lastly at 11:30, Allegaeon brought a storm of technical extreme metal mastery to the stage and played for an hour, after which they also obliged the crowd with an epic performance of the tune ‘Accelerated Evolution’, as everyone in attendance strongly demanded an encore. Allegaeon’s music is more extreme than the definition and confines of the term ‘extreme metal’, as they incorporate the contrast of crystal clear melodic guitar work and monstrous growling vocals together more skillfully than most if not all of their contemporaries. Their sonic quality here was beyond excellent, thanks also to the venue’s PA and the sound guy. Heads were banging at full tilt in the crowd, mosh pits were rolling constantly and it was gratifying to witness an appreciable turnout for Allegaeon, compared to one of their recent headlining gigs at the Roxy a little over a year ago. With no visual or thematic gimmick (except for the momentary appearance of a dude in a crab suit) behind their show, Allegaeon rely solely on the music and the performance, based on the strength of which they’ve built their following in the last two years. 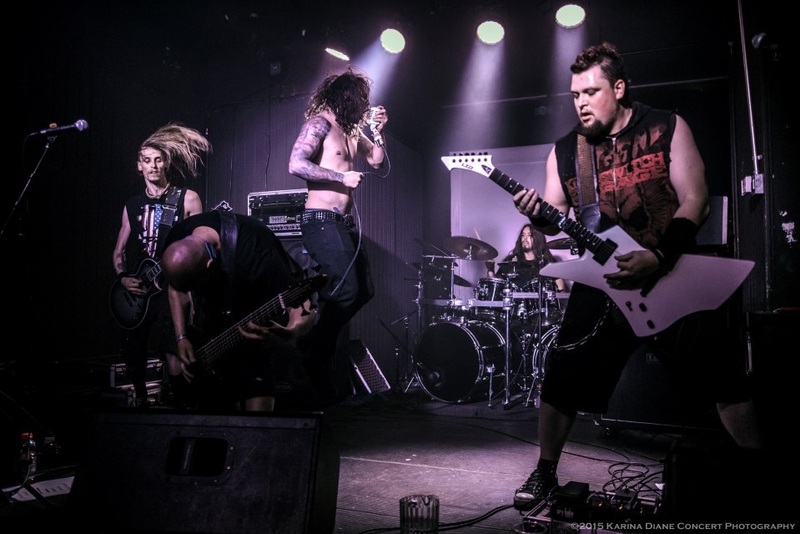 With incredible studio material and live shows such as this one, Allegaeon have indeed become one of the most compelling extreme metal bands going around at present, and will only continue to rise further. There is no such thing as a bad show at Complex, and this Church Of The 8th Day event well and truly lived up to the venue’s ever-growing reputation.